Research shows that piano students are better equipped for school. Young children with developed rhythm skills perform better in early school years. When they get older, they easily comprehend mathematical and scientific concepts. Piano lessons help school kids raise their self esteem and help develop confidence. Numerous studies show that children who play a musical instrument score better on both standard and spatial cognitive development tests. There are also findings that show that children who play the piano score higher in math, especially when maths problems dealing like ratios and fractions are involved. In one particular study, conducted by Dr. Frances Rauscher (a psychologist at the University of Wisconsin at Oshkosh) and Gordon Shaw (a physicist at the University of California at Irvine), tested preschoolers who received piano instruction. They found that these preschoolers scored 34% higher than their nonmusical peers, in tests that measure spatial-temporal reasoning, which is the brain function used to understand math, science and engineering. Learning to play the piano is hard work and needs patience dedication. Not only does each tune mastered increase a child's self-esteem, also showing their newly learned skills at piano recitals can boost their self-esteem, as much as winning a game in a sports competition can. Piano lessons also help children learn how to keep a positive outlook on life, when facing difficult tasks. Understanding that mastering a new skill is a process that requires patience, helps children approach tasks with confidence and avoids disappointment and frustration. Increased eye-hand coordination is almost a fact when children learn to play the piano, but there is more than that. 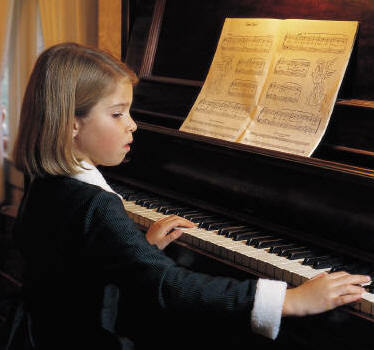 Children who play the piano have improved fine motorial skills. That is probably because, unlike with other instruments, the piano requires both hands to work independently of each other: one moving fast while the other may be moving at a slower rate. All of these aspects help increase a child's overall dexterity and complex mental processes. Reading a piece of music takes a great deal of focus, forcing a child to interpret melody and rhythm, translate these into hand movements on the keyboard and then move on to the next one. Reading and playing music makes them think both critically and creatively, which is a skill that will be of benefit to them whenever they choose to undertake anything in their future lives. Regardless of whether a child will play the piano for a short time or for a lifetime, the long-term effects of their musical career are many. Through playing the piano, children will learn to appreciate a kind of music that they would otherwise never have learned about. They may develop an appreciation for composers like Bach or Mozart, which may stay with them for life. In addition, the skills they have achieved by playing the piano may help them pick up another musical instrument at a later point in life.